Football Club Red Star Belgrade was founded on March 4 1945., shortly after the end of World War II. The same day, 4.3. '45, Red Star played it's first match against Prvog Bataljona Druge Beogradske Brigade, and won 3:2. Starting line up for Red Star's first game was: Golubic, Stankovic, Filipovic, Ciric, Jovanovic, Velickovic, Sapanas, Spasojevic, Tomasevic, Pecencic i Horvatinovic. Next Year, 1946., Red Star made it's debut in Yugoslavian First Division, and finishes the season in third place, behing Dinamo Zagreband Partizan Belgrade. That season FC Red Star participated in Yugolsavian Cup for the first time. The club was eliminated in the quarterfinals. First victory in Yugoslavian Derby was celebrated on Januaru 5. 1947, when Red Star defeated their arch rivals Partizan Belgrade 4:3. 1948. Red Star wins it's first trophy, the Yugoslav Cup. Cup was won next two years in a row, in 1949 and 1950. At the begining of 1950's Red Star built it's stadium, better known as Marakana, which at that time was one of the biggest stadiums in Europe with the capacity over 96.000. In 1951 Red Star won it's first Yugoslav Championship Title. Red Star made it's debue on international scene in the season 1956-57 in European Champions Cup (currently called the Champions League), where Red Star makes it to the semi-final where they are eliminated by italian side Fiorentina after losing 1:0 in Italy, and tieing 0:0 in Belgrade. Until 1959. Red Star had won the Yugoslavian Championship and cup 5 times each. The star of those teams was legendary Rajko Mitic. At the end of 1950's and beggining of 1960's Red Star is led by a new wave of Yugolsavian talented players led by Dragoslav Sekularac. "Seki" became Red Star's first world class player. In 1964. he was unofficaily declared to be the world's best player. Alongside Sekularac, one more great young player played for Red Star and his name was Bora Kostic who was best known by his rocek of a shot. Vladimir Beara who is argubly the greatest Yugoslavian goalkeeper of all time was Red Star's goal keeper. 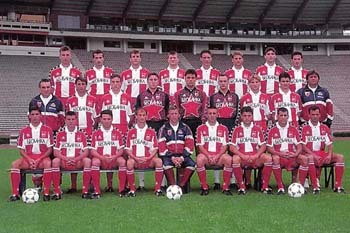 Their leader was a veteran Rajko Mitic, and this is considered to be one of the best teams in Red Star history. However, in 1957-1958 they were eliminated in European Champion's Cup quarter final by then the best team in the world Manchester United. After losing the first leg in England 2:1, Red Star could only mange 3:3 in return leg in Belgrade. During the 1950's Red Star won 6 Championships and 3 National Cups. During the decade of 1960 the club won 5 Championships and 3 cups. In 1970-71 Red Star repeats the success from 1956-57, and it reaches the European Chamipon's Cup semifinals. Unfortunately regardless of a dominating win of 4:1 in first leg in Belgrade, Red Star fell to Greek side Panatanaikos 3:0 in Athens and Greeks were through on the away goal rules. The leader of that generation was the best Yugoslavian player of all time Dragan Dzajic, who is a current president of the club. 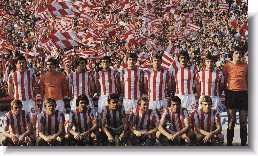 In the year 1979, Red Star reaches it's first European Competition final, the UEFA Cup final. Star's of that team were midfielder Vladimir Petrovic "Pizon" and centerforward Dusan Savic. FC Red Star was unlucky to lose the final to e German side Borusia Mehenglazbah. First game was played in Belgrade and Red Star took the lead only to see the visitors draw on an unlucky own goal. Red Star dominated the first leg but missed series of great opportunities to seal the UEFA Cup victory. In the rematch in Germany, the referees stole the UEFA Cup from Red Star. Both teams played the defensive type of game. After a clear dive by one of the German players in Red Star's penalty area, the referee points at the spot. Borusia scores of the penalty kick and undiservingly wins the UEFA Cup. During this decade Red Star continued their success in domestic league winning 3 championships and 1 cup. During the 1980's Red Star returned to their dominant ways winning 4 championships and 3 cups, but everyone within the club as well as the fans were hungry for European Success. 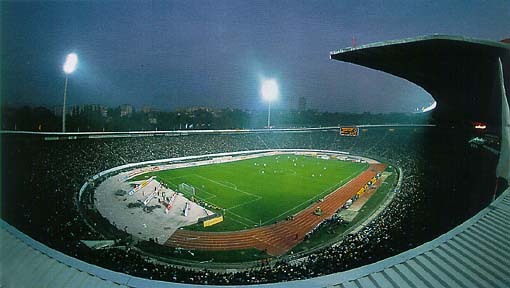 The greatest accomplishment for the RED STAR Belgrade, was winning the European Champions Cup and Inter-continental Cup in 1991. A fenomenal, if not the best, generation of players led by their captain goal-keeper Stojanovic, Savicevic, Prosinecki, Belodedic, Pancev and others, beat French champion in the finals of the European Champion's Cup (0:0, 5:3 on penalty kicks) in Bari, Italy, in May of '91, to win this prestigious Cup and become the best team in Europe. Red Star won the European Championship without loseing a single game. They defeated Grasshoppers 5:3 on agregate, Glasgow Rangers 4:1 on agregate, Dinamo Dresden 6:0 on agregate, and one of the all time best club in the world Bayern Munich 4:3 on agregate. Few months later, in December of '91, RED STAR brilliantly defeated Chile's and South American champions Colo-Colo 3:0 in Tokio, Japan, to win Inter-continental Cup and the World Club Championship. Few players, that helped RED STAR win their European Championship earlier that year, left after winning the European Champions Cup to play for much more money in some of the best leagues in the world such as Italy, Spain, and England. Even without those key players, and without their new captain Savicevic (who was ejected 30min. into a game after receiving a red card when the score was 1:0) RED STAR still managed to pull together and with a player down, they put on a real football clinic for the South Americans, scoring two more goals and taking the World Championship home to Belgrade. One of the greatest heros was the youngest player on the team Vladimir Jugovic who scored twice and was named the MVP of the game. These two triumphs were the greatest accomplishments not just in RED STAR's history but also in Yugoslavian club's football history. RED STAR won the Yugoslavian League Championship 22 times and Yugoslavian Cup 19 times, and both of these statistics are all time records in Yugoslavian football. They also hold the record for the most Double Crown victories (when a team in the same season wins both the League Championship and the Cup) 6 times. Red Star is considered by the UEFA as one of the greatest teams of all time in Europe along with Real Madrid, Manchester United, Juventus, A.C. Milan and Bayern Munich. After this great success the war destroyed former Yugoslavia and after 1995, Yugoslavia was consisted only of Serbia and Montenegro. Due to sanctions imposed on Yugoslavia by the international community Red Star was not allowed to compete in any of the European Competitions from 1992-1995. The political sanctions that had nothing to do with sports, but had a great affect on them, financialy devestated Yugoslavian clubs. After the ban was lifted Red Star could not compete financially with top European Clubs. However, new teams were created from young but talented players from Serbia and Montenegro. Players such as Dejan Stefanovic, Ivan Adzic, Darko Kovacevic, Dejan Petkovic and then Dejan Stankovic, Perica Ognjenovic, Zoran Njegus, were created in a new era of the FC Red Star. These young teams were able to manage several great results in Europe, against much richer teams. These victories include wins and elimination of Kaiserslautern (Germany), Italian side Chievo Verona, French side Montpellleir, and English side Lester City. Red Star has a great history and is the most successful team not just in Serbia and Montenegro but in entire Eastern Europe. These young players are expected to uphold the name and reputation of FC Red Star. Rajko Mitic, is the first Red Star's star. He had all the characteristics that make a great player: self-discipline, team spirit and modesty. He played 572 games, scoring 296 goals in 13 seasons for the Red Star. He was the captain of the team for 11 years. He played 59 games for the Yugoslavian National Team. He become a cult figure among the followers of the "most important secondary thing in the world". Dragoslav Sekularac - Seki, is the second Red Star's star. Today he is remembered for elevating the game to more than just goal-scoring. For many defensive players who were trying to guard him he was unsolved mistery, mission impossible. With his brilliant dribbling and fantastic goals he often raised the fans on their feet. Dragan Dzajic - Dzaja, is the third Red Star's star. The best players of the world looked like schoolchildren when faced with his technique. No defense could stop him. He holds the record for the most games played for Red Star 587, and he is forth on the Red Star's all-time scoring list with 285 goals. Today he works as Technical Manager for the Red Star. Vladimir Petrovic - Pizon, is the fourth Red Star's star. Unforgettable player who always gave his best against the strongest opponents. He holds the all-time record for the most matches played for the Red Star in the international competition, 50 games. Dragan Stojkovic - Piksi, is the fifth Red Star's star. He is a player with a great heart, with strength and endurance for three players. Piksi's specialities were his "sniper like accurate" passes, his killer free kicks and corner kicks from which he often scored. He was probably one of the most popular Red Star's Players during the 1980's. Stojkovic represented Red Star well everywhere. In the World Cup in Italy he scored two goals of which one is regarded as one of the greatest goals in the history of World Cup. Today he is the president of the FA of Serbia and Montenegro.